Pharma Marketing Blog: Country Music Superstar Judds Corner the Pharma Celebrity Market! Country Music Superstar Judds Corner the Pharma Celebrity Market! Country music superstars Naomi Judd and her daughter Wynonna Judd have cornered the pharma celebrity marketplace -- at least for now. 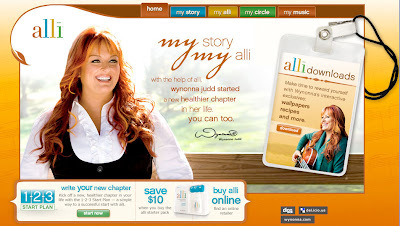 Jim Edwards reports that GSK signed Wynonna Judd to endorse Alli, "Its Flagging Weight Loss Drug" (see the story here). "with the help of alli," says the new alli Web site featuring Wynonna, "wynonna judd started a new, healthier chapter in her life. you can too." Meanwhile, back on the PhRMA site, Naomi Judd is featured because she will appear on a "Sharing Miracles" Television Program produced by PhRMA (see here). I stumbled upon this "coincidence" only because I was trying to remember if the the new PhRMA Guidelines on DTC Advertising required celebrities to disclose that they were being paid to endorse the product. Unfortunately, the new code does NOT require any such disclosure. Is this truly a coincidence or could it be that this is a mother-daughter/PhRMA-GSK collaborative deal? Mom could have brokered the deal by agreeing to appear on the PhRMA TV show if Wynonna got the alli gig, which may help her career. Unlike her mom, Wynonna has not won a Grammy -- at least from what I can learn from this wikipedia entry. I also learned that "In November 2003, Wynonna appeared on an episode of The Oprah Winfrey Show discussing what she described as a 'severe' dependency on food. She had been working with the show in an effort to lose a significant amount of weight and get to the root of her dependency. In September 2005 Wynonna made a second appearance on the show, discussing how she had lost some weight (but had yet to reach her goal weight)." She was also treated for "food addiction" at the Shades of Hope rehab center in Buffalo Gap, Texas. I'm sure alli will solve her problem whereas neither Oprah nor rehab did!